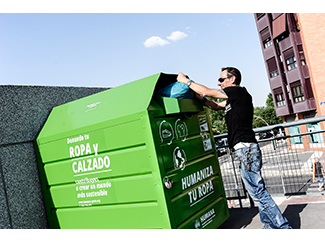 Humana collected 16,853,294 kg of textile used in Spain in 2015 through a network of 5,114 containers and 37 secondhand stores and thanks to the collaboration of more than two million donors. The organization has a staff of 420 employees, which means that generates a permanent full-time job for every 40,000 kilograms of used clothing collected. "Fortunately, there is growing awareness of environmental and social benefits associated with the proper management of waste textiles. We are grateful to the citizens for their donations and want you to know that behind each container there is intense preparation for reuse, in order to extend the life of the garments and promote social projects, "says Elisabeth Molnar, General Director of the Foundation. Reuse and recycling of textiles contribute to environmental protection, giving a second life to a garment that would otherwise go to landfill: every kilo of clothing is reused and not incinerated it prevents the emission of 3,169 kg CO2 according to the European Commission. The 16,853 tonnes collected last year represent a saving of 53,408 tons of CO2 into the atmosphere. Or what is the same: that is equivalent to 2.9 million cars stop circulating for one day or 856 million trees longer absorb pollutants, also in a day. The management hierarchy established by Law 22/2011, of July 28, raw preventing the generation of waste, driving on appeal preparation for reuse, in the third instance recycling and material utilization, followed by other types in unrealized including energy, and finally the provision or safe disposal, when all other options have not been possible. All resources generated with the activity of collection and recovery of clothing in Spain are devoted to the social order of the organization. 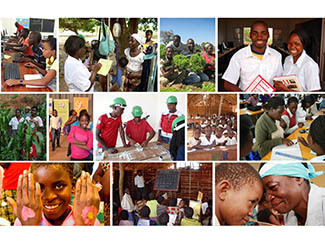 As a result, between 2010 and 2014 9.3 million euros to education and agriculture projects in Africa, Latin America and Asia were allocated. 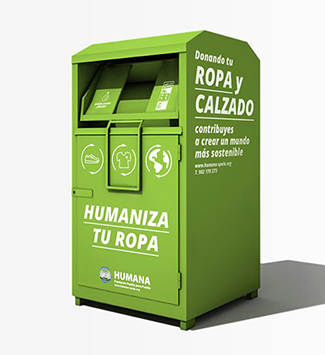 "Clothes enhanced by Humana has become real support for these populations thanks to the citizens and the institutions that support our work. Our funding model ensures sustainability of the Foundation and its programs of cooperation in a period in which the Spanish public funds for cooperation have fallen, "says Jesper Wohlert, general coordinator of Humana.